The USA Holt Gas-Electric Tank is the first true US developed tank. It was a joint project between Holt manufacturing who built tractors and the General Electric Company. 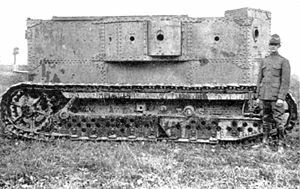 Holt gun haulers with caterpillar tracks had been used in the early days of World War I, so one was fitted with a steel box shaped structure with a V-Shaped front. A how was fitted in the front and Vickers Machine Guns on the side of this. Propulsion was supplied by a petrol engine that powered GEC motors, x1 each side which powered the steering on the tracks. A single prototype was built in early 1918, but not adopted in to US Army service.